Tamamo-no-Mae. Print by Tsukioka Yoshitoshi. Tamamo-no-Mae (玉藻前) is a legendary figure in Japanese mythology and folklore. 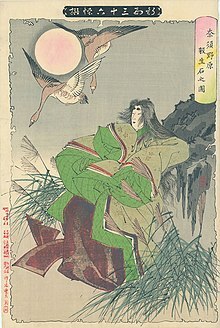 In the Otogizoshi, a collection of Japanese prose written in the Muromachi period, Tamamo-no-Mae was a courtesan under the Japanese Emperor Konoe. She was said to be the most beautiful and intelligent woman in Japan. Tamamo-no-Mae's body mysteriously always smelled wonderful, and her clothes never became dirty. Tamamo-no-Mae was not only beautiful, but she was very wise in all subjects. Although she appeared to be only twenty years old, there was no question that she could not answer. She answered every question posed to her, whether about music, religion, or astronomy. Because of her beauty and intelligence, everyone in the Imperial Court adored her, and Emperor Konoe fell deeply in love with her. After some time had passed, the Emperor suddenly and mysteriously fell ill. He went to many priests and fortune-tellers for answers, but they had none to offer. Finally, an astrologer told the Emperor that Tamamo-no-Mae was the cause of his illness. The astrologer explained that the beautiful young woman was in fact an evil fox with nine tails (kitsune), who was making the Emperor ill in a evil plan to take the throne. Following this, Tamamo-no-Mae disappeared from the court. The Emperor ordered Kazusa-no-suke and Miura-no-suke, the most powerful warriors of the day, to hunt and kill the fox. After escaping from the hunters for some time, the fox appeared to Miura-no-suke in a dream. Once again in the form of the beautiful Tamamo-no-Mae, the fox told Miura-nosuke would kill it the next day, and begged for its life. Miura-no-suke refused. Early the next day, the hunters found the fox on the Plain of Nasu, and Miura-no-suke shot and killed the magical creature with an arrow. The body of the fox became the Sessho-seki, or Killing Stone, which kills anyone that comes in contact with it. Tamamo-no-Mae's spirit became Hoji and haunted the stone. Hoji is said to have haunted this stone in the Japanese prefecture of Nasu until a Buddhist priest called Genno stopped for a rest near the stone and was threatened by Hoji. Genno did a certain spiritual ritual, and begged the spirit to consider her spiritual salvation, until finally Hoji surrendered and swore to never haunt the stone again. In Matsuo Bashō's famous book, The Narrow Road to the Deep North (Oku no Hosomichi), Bashō tells of visiting the stone in the Japanese prefecture of Nasu. Tamamo-no-Mae's legend served as base for the noh drama Sesshoseki ("The Killing Stone") and the kabuki play Tamamonomae (or The Beautiful Fox Witch).